If you keep your food and drinks in an ice box, light your campsite with a kerosene lantern, or figure living in the dark ages with respect to modern high-tech battery-powered accessories is for you… then this article is definitely NOT for you. If however, like most 4x4’s these days that are being fitted with all manner of mod cons (gimmicky or necessary) then setting up a ‘complete’ 12 volt power system needs careful consideration. No doubt, fitting a dual battery system should be one of the first ‘must have’ items in any touring 4x4. Sure there’s the obvious powering of the fridge, but there are plenty more uses of that second battery, plus there are new charging options to consider. Starting from scratch in my Troopy, I initiated the project with a second battery tray from Piranha Off Road Products that would accept a standard N70Z sized battery carcass. While it would be nice to go larger capacity, realistically, that’s all that will fit under the bonnet of the Cruiser, plus the larger they get the heavier they become. The tray arrived with all mounting hardware and instructions and easily fits on the passenger side directly behind the standard battery and just in front of the fire wall. I’ve had a good run from Fullriver AGM batteries before, so decided to stick with the brand and this time opting for a DC Series and a 105-12B model which is rated at 105 amp hours, weighs in at a hefty 30.2kg and incorporates M6 bolt style terminals. While there is no taking away from the required strength of the tray, plus the quality and longevity of the battery, the big choice was the charging system. 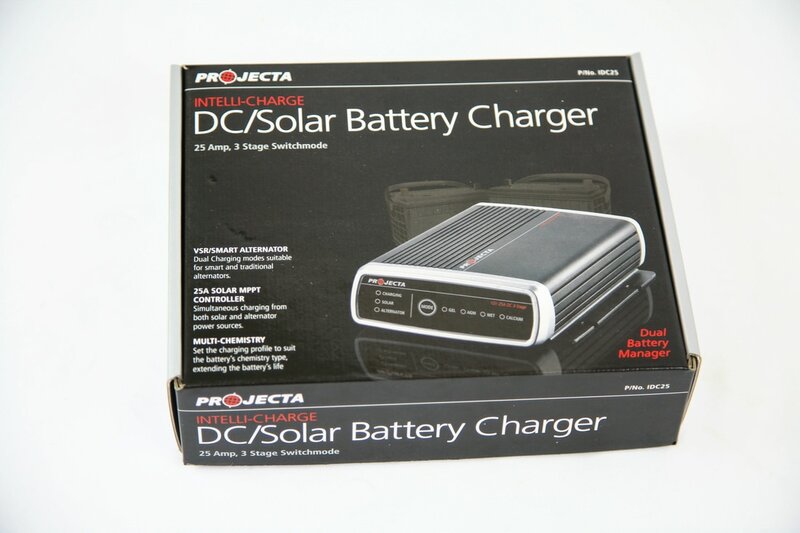 For this, I’ve gone with a recently released Projecta Intelli-Charge 25A DC / Solar battery charger, which incorporates (as the name suggests) a ‘solar in’ wire to allow efficient battery charging from a solar panel. The charging unit is suitable for both ‘smart’ and ‘dumb’… or traditional alternators, has a 25 amp 3-stage switch mode, simultaneous automatic charge system for solar and alternator plus also features the ability to choose the correct charging profile to suit your chosen battery type (AGM, wet cell, calcium or GEL). While I thought I wouldn’t take advantage of the auto selecting mode for alternator and / or solar charging as I don’t have, nor want, a solar panel fitted permanently on the roof, it has come in handy as I’ve mounted an Anderson plug on the bull bar, so the under bonnet system doesn’t need touching when I plug or unplug the solar panel which is out in the sun while I’m parked in the shade – beauty! The charger unit incorporates tiny LED lights to indicate which charging source is being used which puts my mind at ease to know its working as it should. Other than setting the battery type on the front panel, there really is nothing else to this smart charging system… set it and forget it. Having different battery types for starting (generally wet cell) and secondary (or auxiliary battery) as an AGM is all taken care of; something not all charges can handle correctly. While I opted for an under bonnet mounting (it can take the higher heat), the unit can be fixed pretty much anywhere within your 4x4 and is IP67 as well as shock and vibration proof. For what it’s worth, I’ve fabricated a small bracket to fit the unit between the secondary battery and the inner mud guard… A tight squeeze, but I can still preview the lights on the face if need be. With the power source and power management taken care of, my next job was to work out how to expend all that energy, via 12 and 240 volt outlets. Given the expansive use my Troopy has to take on; charging kids electronic toys on the run, charging work related cameras and computer gear, as well as running all manner of 12 volt gear for testing, I figured picking through the NARVA catalogue for all I needed with the pretence of “the more outlets the better”, just to be sure everyone and every situation was taken care of. The left hand side Troopy dash features a rather useless sized pocket that seems perfect for nothing more than a few dozen business cards… provided you don’t drive up a steep hill and allow them to slide out and all over the passengers lap! So, a flush mount ciggie and dual USB outlet was screwed straight over the top of it – no great loss in my book! At a later date, I’ll be making a custom centre console to house switches, gauges and power outlets, but in the meantime, I’ve mounted two double ciggie plugs for front seat passenger and driver as well as the second row of passengers to access. Behind the third row of bucket seats I’ve flush-mounted three ciggie outlets (for rear passengers use and camping use out the rear doors) and a merit plug for direct power access for my 12 volt fridge. These are hardwired direct to the auxiliary battery for constant use. Also hard wired, is a 300 watt Projecta pure sine wave inverter that is mounted and easily accessible from the rear cargo area. The rear bumper bar houses a 50 amp Anderson plug that will plug into my camper trailer to charge on board batteries, instead of trying to do it via the too-small-diameter 7-pin plug wiring. I’ve connected the ‘solar in’ wire of the Projecta charging system with another Anderson plug and tucked it in behind one of the upright posts of the Opposite Lock bull bar, so it’s easily accessible and doesn’t require lifting off the bonnet to plug the solar panel in. Both Anderson plugs have a rubber cap to keep dust and water out while not in use. Incidentally, my foldable Projecta solar panel came with alligator clips, so I’ve cut them off, installed an Anderson plug in-line and then reinstalled the alligator clips so the panel can be used via my on-board charge system with the Anderson input plug or via the alligator clips onto my camper trailer battery. While I was playing with all things electrical, and given I kept the FYRLYT Nemesis 9000 driving lights from my last Cruiser, I had my local sparky wire up a custom heavy-gauge driving light loom complete with 12 to 24 watt converters to tackle these brilliant 24V halogen driving lights. Not that I have all the switches connected yet, I took into consideration future camp lights, an on-board compressor and various other lighting that I want to fit by fitting a bank of five NARVA toggle switches. These things are beaut; as you can utilise as few or as many switches by making up a bank that then slots into your dash, console or any other panel. While I’ve gone for 5 switches, I must admit to not knowing exactly what I’ll run off them… just future-proofing the system. To keep track of what each battery is charging and discharging at, I’ve also popped into the dash, next to the steering wheel, a Projecta Dual battery volt meter that not only has a bar graph and digital readout to 0.1 of a volt for each battery, also incorporates a user-set audible alarm to warn of over or under-charging. While my 12 volt abilities extend to being able to tackle most of this work, firstly, it would have taken me an age to do it all, it would never be the neatest of jobs and may or may not been something to be proud of, so I delegated the huge job to my local sparky at Camden Haven Auto Electrical. Given my need to tow not just my own camper trailer, heavy loads including a Kubota tractor a tandem box trailer and various caravans for work, I figured the 3500kg tow rated Troopy needs as much help as possible to help pull up without over-stressing the brakes, so a Red Arc Tow-Pro electric brake controller was installed. Regardless of how good the unit works, I must admit to choosing it partially for the remote-fitting of the main body under the dash… out of the way of my knees and not taking up any real estate on the fast-filling dash board. The only ‘tell-tale’ of this Red Arc system being fitted is the small rotary dial fitting to the dashboard. Now, I know there will be plenty of setups that are fancier, more technical and more comprehensive than what I’ve installed, but I reckon my set up will do everything needed for personal and work related use, is reliable, simple to use, maintenance free and will enable (almost) endless power usage. I’ve gone overboard with a few of the centre console switches, but that’s for ease of adding accessories at a later date, so all up my system is future proof and will return many 12 volt benefits while out on the tracks and camp grounds. Now; who needs a 12 volt gadget charged?